Drive north through the city of Boulder on your way into one of America’s most treasured National Parks. Stroll around a snow covered Glacial Lake, carved out and dammed by glaciers long ago. Observe herds of elk grazing on rich grasses in Moraine Park. See incredible mountain and park views at Many Parks Curve. Witness the destructive force of Mother Nature while walking around an alluvial fan in Horseshoe Park. Visit the mountain village of Estes Park and have lunch on your own in one of the many restaurants or cafes, stroll the river walk and enjoy souvenir and boutique, shopping or choose to visit the Historic Stanley Hotel. Your day begins at 8:15am where you will be picked up by your tour guide in a clean, comfortable touring van from Union Station in beautiful downtown Denver. You will start your tour by driving up to Rocky Mountain National Park through Boulder, Colorado. 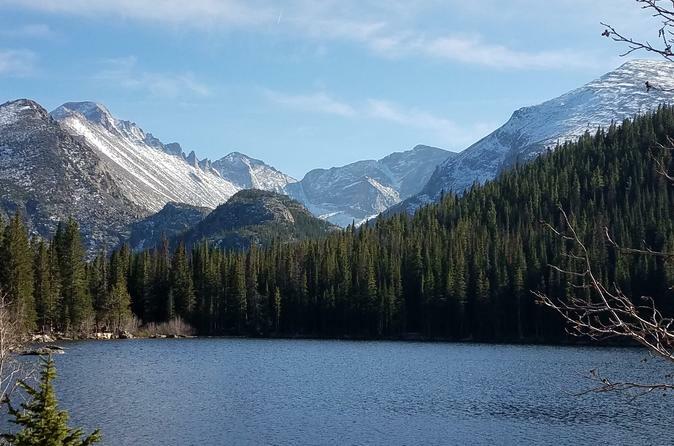 Once in the park (admission included), you will see the many beautiful snow capped Rocky Mountains and enjoy a stroll around a glacial lake and see herds of elk grazing on rich grasses in Moraine Park (wildlife viewing likely but not guaranteed). Then, you make your way up to Many Parks Curve on Trail Ridge road to see incredible high mountain peaks and expansive park views. Next, you'll head over to Horseshoe Park and witness the destructive force of Mother Nature while taking a short walk around an alluvial fan. You will finish your day in the quaint mountain village of Estes Park where you can enjoy lunch at one of the many cafes or stroll through some of the wonderful artisan and souvenir shops. You then return to Denver on a beautiful drive where you will be dropped off back at Union Station where you began your day. Snacks, bottled water, and beverages are included in the tour. The entire day is approximately 8 hours.